MOSCOW — The current stand-off between Russia and the West over the situation in Ukraine will not affect the scheduled construction of South Stream gas pipeline, the Financial Times reported Sunday quoting the head of the Austrian energy group OMV. “Nobody can tell you not to build a pipeline. It’s a matter of national law… Everybody can decide for themselves. A pipeline is a 50-year project, so one should look at things realistically… A few months is not an issue,” Gerhard Roiss was quoted as saying. He added that possible EU sanctions against Russia targeting the country’s gas industry would be an unwise decision. “We have had integration in the area of gas with Russia for 45 years. Customers rely on getting their gas delivered. For that reason I don’t see any room for sanctions on gas,” the OMV chief elaborated. Roiss also stressed that Russia is already delivering gas via the Opal pipeline with an annual capacity of 36 billion cubic meters even though Russia’s Gazprom had not secured an EU approval to run the pipeline at full capacity. Opal passes through Germany connecting the new trans-Baltic North Stream pipeline with gas transmission networks in Western and Central Europe. Ross also insisted that an increase in the number of supply routes to Europe will benefit energy security. “Four pipelines are better than three, and five are better than four. That is the pragmatic view,” he said. Gazprom is constructing the South Stream pipeline across the Black Sea to Southern and Central European countries with aiming to diversify export routes for Russian gas. The construction started in late 2012, with the first deliveries expected in 2016. The pipeline is expected to become fully operational in 2018. The European Commission is trying to hamper the project saying it violates the EU Third Energy Package banning the companies involved in gas production from owning long-distance pipelines in the region. On June 24, Gazprom and OMV signed a shareholder pact of the joint venture South Stream Austria, defining the principles of construction and further operation of the respective gas pipeline on the Austrian territory. 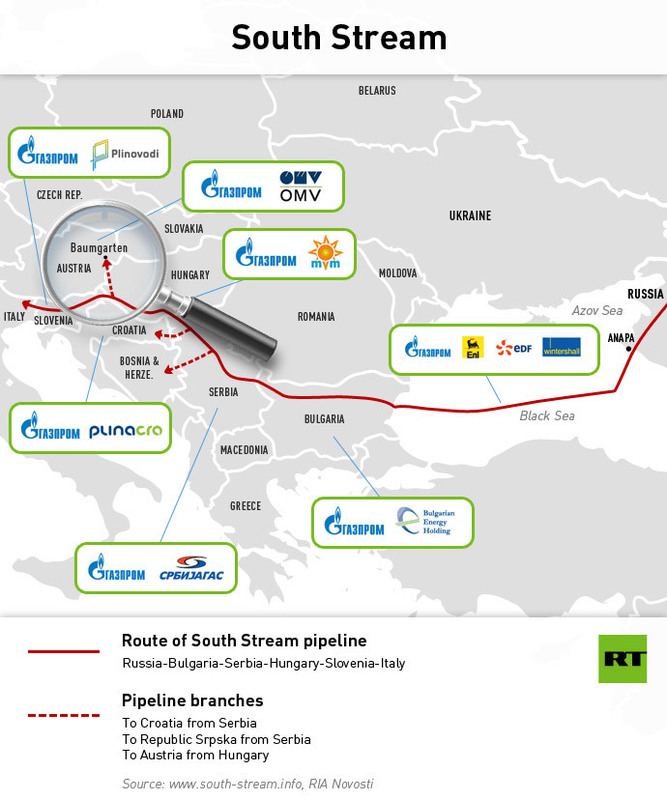 At Tuesday’s meeting in Vienna, the creation of South Stream Austria was announced. The company will be 50 percent owned by Gazprom, Russia’s largest gas producer, and 50 percent by Austria’s OMV Group, the country’s largest oil and gas company. At Tuesday’s meeting in Vienna, OMV CEO Gerhard Roiss said that South Stream fully complies with EU legislation. “This project- investment in European energy security- will fully comply with EU legislation,” Roiss said, as quoted by ITAR-ITASS. “If Ukraine begins to siphon off gas, we will increase supplies via North Stream, and maximize the load through Yamal-Europe,” Aleksey Miller, CEO of Gazprom, said Tuesday in Vienna. The Turkish newspaper, Hurriyet, reported that Turkish Prime Minister, Recep Tayyip Erdogan, will meet Russian President, Vladimir Putin, in Moscow at the end of November, when discussions will focus on the Syrian crisis. Hurriyet noted that Erdogan will visit the Russian capital where he will head a delegation of a large number of ministers and will preside over the meeting of the joint ministerial committee of the Turkish-Russian Cooperation Council during 21st to the 22nd November. The meeting will discuss several political, trade and investment issues between the two countries. Deputy Russian foreign minister, Alexei Meshkv, said that the two sides will address several regional and international issues of mutual interest and will discuss ways to develop bilateral relations. In an exclusive interview with the Turkish newspaper Meshkov asserted that Russian-Turkish relations are evolving in several areas, especially in the energy field. The two sides are also cooperating on the construction of the Mersin Nuclear Power and the South Stream natural gas pipeline project, which will pass through the Black Sea. Norway, Russia’s closest rival in the European gas market, seems to overtaking Russia’s Gazprom. Norway boasted record high exports in 2012, while Gazprom suffered the worst numbers in 10 years. Norway increased its exports 16% in 2012 to reach 107.6bn cubic metres, according to Europe’s key statistics office Eurostat. This is “a record level, close to the Russian gas exports to Europe,” Michael Korchyomkin, head of East European Gas Analysis, told Kommersant daily. During the same period, Russia’s gas giant Gazprom cut sales to Europe and Turkey by 8%, according to the company’s head Aleksey Miller. That’s the lowest export level for the last decade, Korchyomkin said. At the moment Norway is breathing down Russia’s neck in its key European market – Germany. In 2011 Gazprom supplied 30bln cubic meters out of the total 80bn cubic meters of gas Germany consumes annually. Norway sold just a bit less – 28bn cubic meters. Norway’s Statoil accounts for about 70% of the country’s exports and in 2012 signed a 10 year contract to supply gas to Germany’s Wintershall. Norway’s lower gas prices are another tool to win customers. The country’s Petroleum Ministry is suggesting charges for gas transportation in new contracts should be significantly cut, according to Reuters citing Norwegian Petroleum Minister Ola Borten Moe.The exact price cut remains unclear, with Kommersant daily assessing it at 7%. Competitive pricing has become a crucial issue at a time when crisis – stricken Europe can’t afford huge bills. On Thursday Gazprom 9M 2012 IFRS results showed things are not that rosy for Russia’s’ gas monopoly. The company’s profit for the period was down 12% year on year to $27.1bn, with the net sales of gas decreasing by 8% year on year, to about $61.4bn. Net sales exclude the amounts paid by the company in form of value added tax and customs duties. Earlier in the week Fitch rating agency predicted a further fall of sales for Gazprom in 2013, referring to weak economic conditions and slack demand.